For 3/16" to 1-1/2" O.D. tubing. 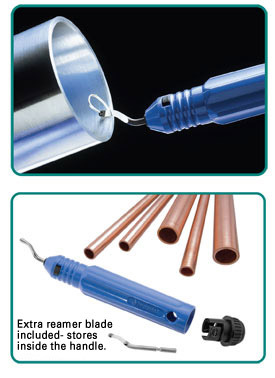 Reams both inside and outside edges of tube with 3 hollow ground cutters. Deburrs both clockwise and counterclockwise. Fluted body is shaped to fit comfortably in palm. IMP.208-F Reamer for copper, aluminum and brass tubing. Hardened steel cutter blades. Blue finish. Wt. .63 lbs. IMP.208-FSS Reamer for aircraft grade stainless steel tubing, hard or soft copper, aluminum, brass and steel tubing. Tungsten hardened tool steel cutter blades. 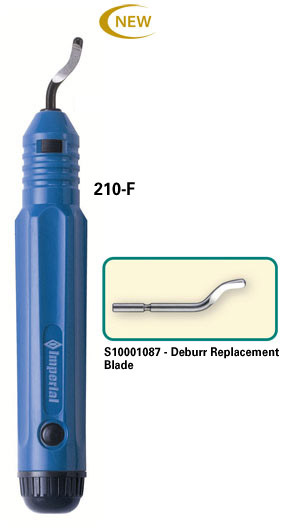 The rotoary style blade is perfect for removing burrs from holes and edges. Large ergonomoc handle reduces user fatigue. Enclosed handy internal storage cavity for storing extra blades. Ships complete with two heavy duty blades. For copper, steel, aluminum, zinc, cast iron, brass and plastic tubing. Length 5-3/4". Wt. 1.5 oz.